An important WWII story: Standing Up Against Hate by Farrell – Joyce's mystery and fiction book reviews with some non-fiction too! Kudos to the author and publisher for this informative and important book. It deserves a place in all school libraries and would be an excellent read for Black History Month (or any month). Thank you to NetGalley and the publisher. 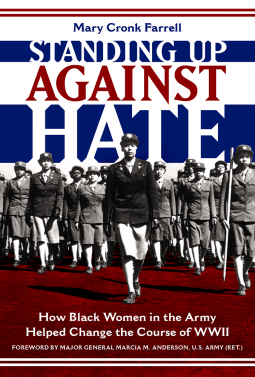 This non-fiction work tells the story of African American women’s entry into the Women’s Army Corps of WWII and their experiences while in the service, as they trained and were assigned to their duties. Issues of prejudice were quite present and the women’s responses, protests and efforts are noted. Two things made this book exceptional: One was the photos that illustrated the text; the other was that women were named and quoted. These makes the book feel intimate and real. I had an aunt who served in WWII. I wish that I had spoken to her more about her war experiences. I hope that she knew about and respected all of the African American Corps members. This book is highly recommended…and not just for children! ← Some of today’s e-book bargains-What great choices!